We’re a sensor-based solution for smart city deicing. Most people know deicing as road salting. It is the most effective tool that cities have at their disposal for keeping roads clear of snow and ice. When it was introduced 50 to 60 years ago, it reduced accidents by 95 percent and was a huge revolutionary breakthrough. Since then, it has been used and overused. We’re getting to a point where it is starting to cause a lot of environmental disasters. For example, the Flint, Michigan crisis was because the water was so corrosive due to the excessive amount of chloride from surrounding areas' salt. It is reaching a point where both environmentalists and salt manufacturers are trying to cut back usage by 50 percent. U.S. cities are at a crossroads. Safety is a huge issue here. When road salting was launched, there was a huge decrease in accidents – so now, trying to cut back usage of something life-saving is a big deal. It's not something cities can do very efficiently. What I have developed at Frost Control Systems is a road temperature sensor. We can place them throughout cities so they know which areas are warmer, and in warmer areas they can safely reduce the usage of salt – and in other areas - have faster response times to dangerous weather hazards. It's all about maintaining safety while reducing the usage of the salt. Q: For how long has Frost Control Systems been in existence? This all started three years ago. I did a lot of work with the city of South Bend, Indiana and its Parks and Rec department. One thing led to another, and I got to know the South Bend streets department. We did a lot of deicing, and we wanted to see if there were any solutions to improve it. I called about 10 to 15 cities, and I received about 70 responses on how to improve their deicing regiments. I noticed that all of their responses hinged on one big, major factor: Knowing the temperature of the roads. That is where this was born. I've been designing this sensor for the last two years. It is custom-built for South Bend. It has been functioning there since last winter, but now I'm expanding. I'm talking to a number of cities in the country and trying to fit them into the installation schedule, but right now it appears we'll be in four more cities by the time winter comes this year. This sort of product takes a lot of field testing, so 2019 will be the big year for us as we'll be officially launching the sensor as a finished product instead of as a discounted field test! 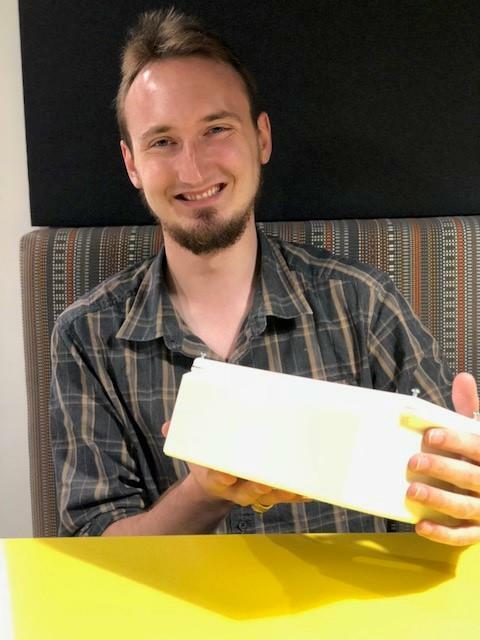 I won the IoT showcase pitching competition at Connexion IoT in May, and as my prize I won a free, 3-month membership to the Connectory and a Dremel 3D printer! The printer has helped me a lot with the prototyping process for the sensor I've been working on - so that is extremely beneficial. I'm still based out of South Bend, so it's nice to work from the Connectory and still be close to that. I come here at least once a week, and I make connections. A lot happens in Chicago, and a lot of people come to Chicago from around the world. It's really a great space for me to bring in my own people and to meet other people working on IoT-related projects. It's an exciting and influential space! Q: Random, fun question: If you found $1 million right now on the sidewalk, what would you honestly do with it? With that money, I could get a trial of six of these sensors up to every city that has a population of more than 50,000 people in the U.S. That would just revolutionize the whole city environment for this sort of data. Highways have used this for years – but they have a much larger budget. Cities are five years behind in terms of technology. This would be a huge kickstart in getting them caught up with this sort of data. Or, from a more personal perspective, I’m a big person when it comes to bringing up parks in local neighborhoods. I’m a big believer if you have a big park in your area – everyone will want to be there. They solve problems in various communities. That has always been where my heart lies.